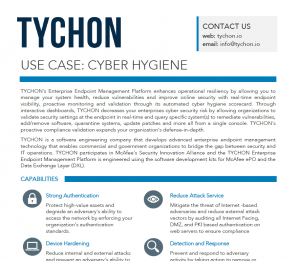 TYCHON’s Enterprise Endpoint Management Platform enhances operational resiliency by allowing you to manage your system health, reduce vulnerabilities and improve online security with real-time endpoint visibility, proactive monitoring and validation through its Automated DoD Cyber Hygiene Scorecard. Through interactive dashboards, TYCHON decreases your enterprises cyber security risk by allowing organizations to validate security settings at the endpoint in real-time and query specific system(s) to remediate vulnerabilities, add/remove software, quarantine systems, update patches and more all from a single console. TYCHON’s proactive compliance validation expands your organization’s defense-in-depth. Protect high-value assets and degrade an adversary’s ability to access the network by enforcing your organization’s authentication standards. Reduce internal and external attacks and prevent an adversary’s ability to escalate privileges by ensuring all asset have proper computer configurations, computer patches are applied, and all Internet Facing webservers are within the DMZ. Prevent and respond to adversary activity by taking action to remove or quarantine internet facing webservers, systems with CAT 1 findings, expired RMF packages, 120+ days IAVAs, obsolete office assets, and unauthorized user accounts.